A note on the Zucchini — So Sunday was a lovely day here in Northern Maryland and I finally got out into the garden to do some rehab and bit of planting. Being an optimistic kind of human, I planted Zucchini — yes, I’m one of those people who thinks you “can NEVER have too much Zucchini.” So I started a packet of seeds, knowing full well that I’ll get Zuke in my weekly box from the farmer co-op come summer. With this in mind I went to the freezer to free it of some of last year’s crop. I let a bag thaw over night than (after cracking the ziplock seal) gave it an assist in the microwave for a minute. Then (over the sink) I pierced the bottom of the bag in several sections and squeezed the water out. I got 1 cup of compacted Zucchini. Frozen Zucchini. On the left is an unthawed bag straight from the freezer. On the Right is a thawed bag drained of excess water. 1. 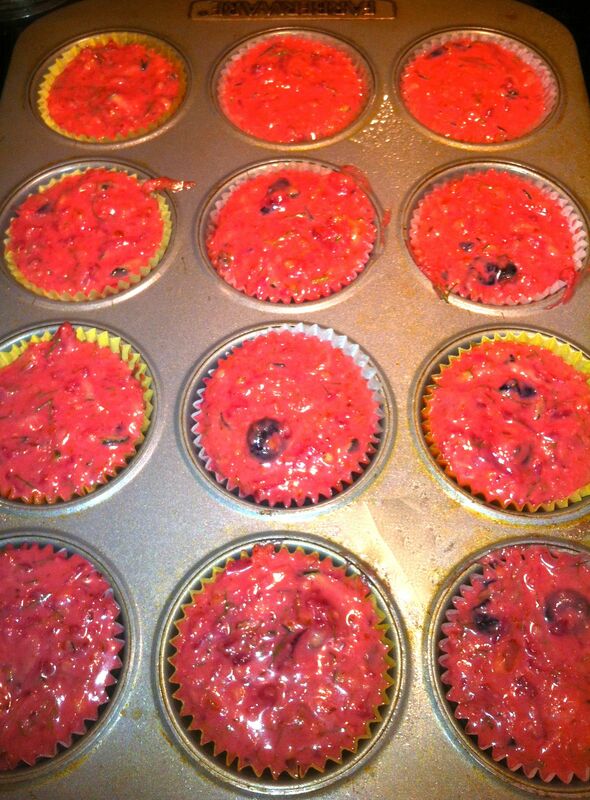 Preheat oven to 400 degrees and Prep muffin cups with cooking spray. (I used 12 medium-sized muffin cups). 3. In a medium bowl, combine the Zucchini, Lemon Zest, Canola Oil, Egg and Milk and stir well. 4. Add the wet to dry and mix until combined. 5. Chop up the Fig into small segments. Cut off the tops of the figs. Cut fig in quarters length wise, then dice. 7. 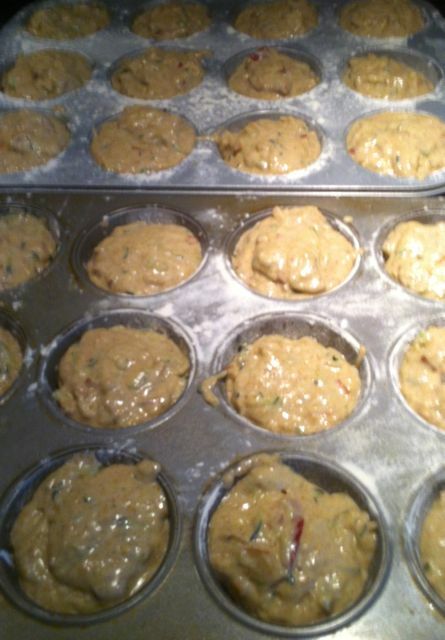 Divide the batter evenly into the muffin cups. With a wet spoon smooth out the muffins. 8. Bake for 20 minutes or until muffins pass the toothpick test. These babies would pass any test. Bring it on tooth pick. These came out perfectly. Dense, but not gummy. Crunchy at the top. Just sweet enough, but not overly so. I think they’ll keep and travel well because they weren’t moist. But they weren’t so dry that you’d need to add butter or apple sauce to enjoy them. Yum. 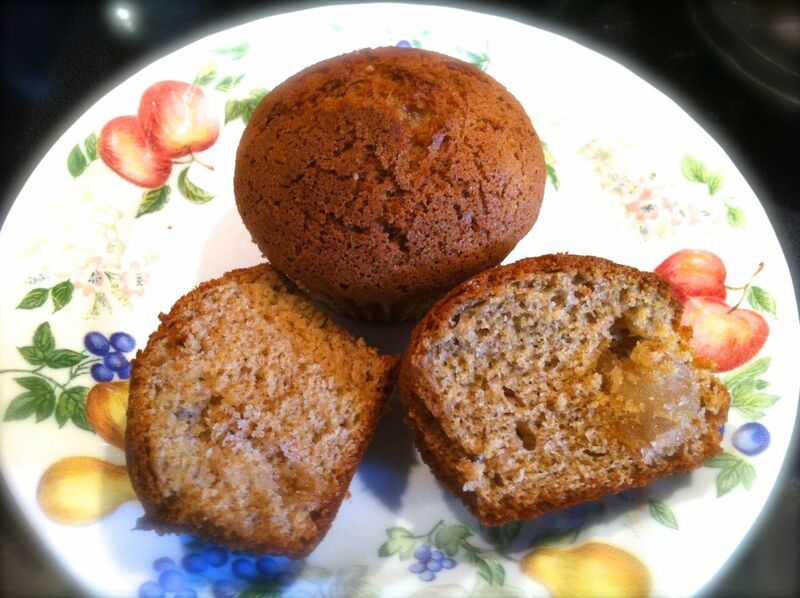 I’ve been thinking about Pumpkin Muffins since the magical orange orbs started to appear at the Farmer’s Market. The other day I gave in and bought a can of pumpkin puree. 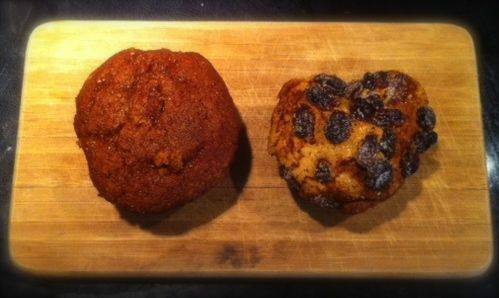 Plain Pumpkin muffins and Raisin enhanced Pumpkin muffins sit side by side in harmony on my mini cutting board. 2. 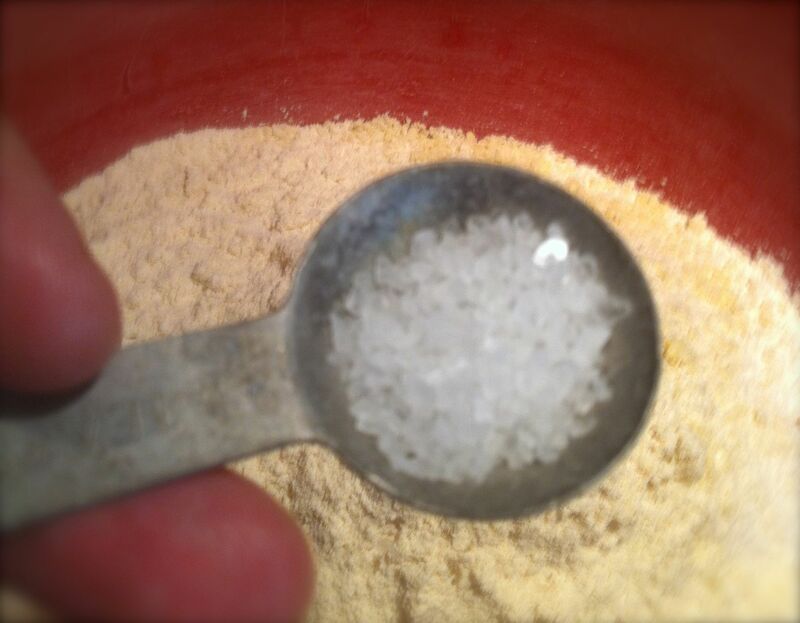 In a medium bowl combine the Flour, spices, Baking Soda and Salt. 3. In a large bowl mix Pumpkin, Sugar, Eggs, Oil and Apple Cider. 4. Add the dry ingredients to the Pumpkin mixture. Beat until well combined. 5. Divide evenly into the 24 muffin cups. 6. If you want a special treat you can add Raisins — Toss the Raisins and the tablespoon of sugar together in the dry ingredient bowl. Spoon onto the tops of the muffins. (I did half and half). 7. Bake for 25 to 30 minutes or until muffins pass the toothpick test. Cool 10 minutes then remove from muffin cups. 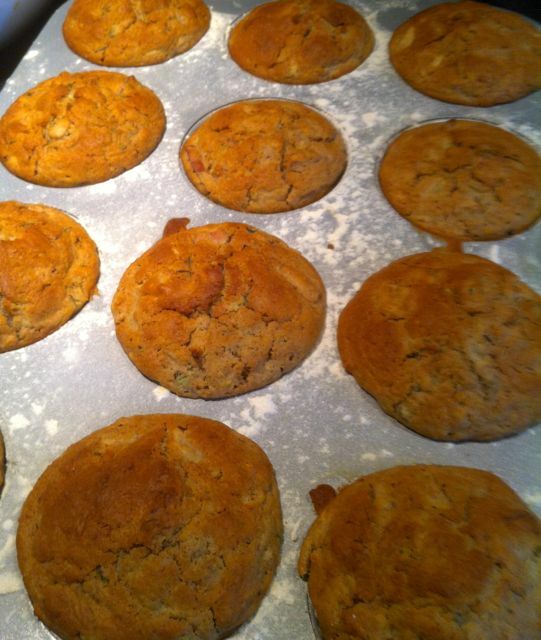 And here’s what they looked like when they came out of the oven. WHAT? Today’s not Monday! Its OK. Don’t touch that dial. You haven’t fallen into a muffin time warp. I just got swamped by freelance yesterday and, although I did MAKE these yummy muffins yesterday, I didn’t get around to posting about it until today. 1. Preheat oven to 400 degrees. 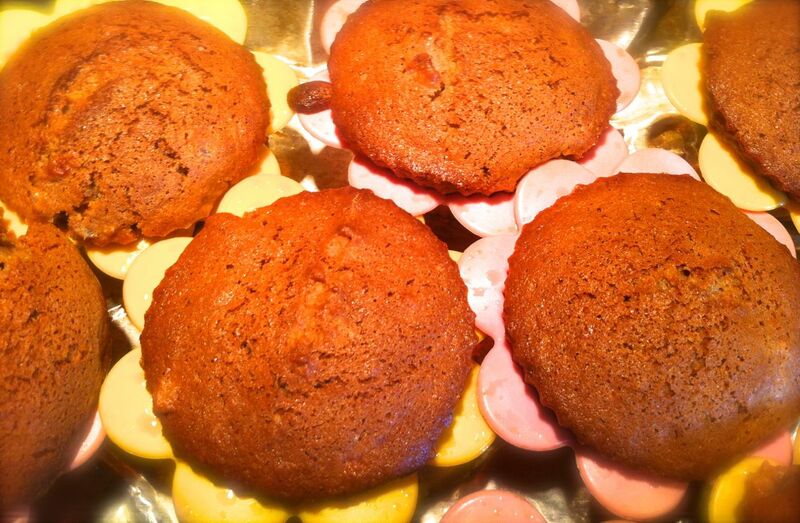 Prep muffin cups by spraying with cooking spray and dusting with flour. 2. Chop the Apples and grate the Zucchini. DRAIN the Zucchini! 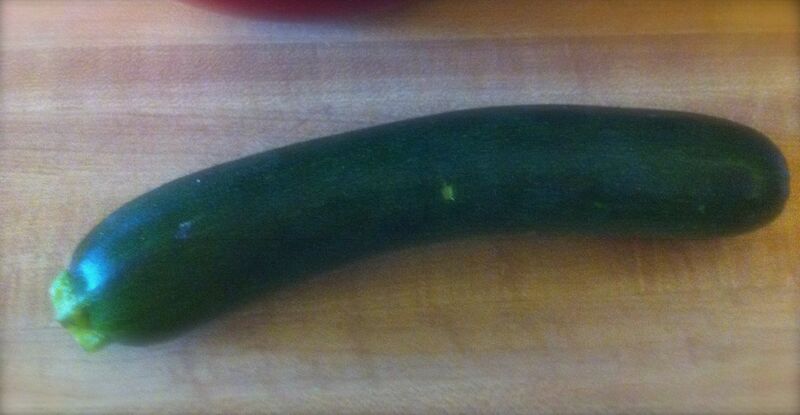 Its October and the Zucchini available at the farmer’s market is roughly the size of a preemie baby. I picked up two for a buck a piece on Saturday. Half of one of those mega Zukes was enough to yield the 2 cups I needed for this recipe, but the larger gourd meant much more fluid. So I put the whole grated batch in a sieve to remove the liquid. BONUS! I was able to cut down on the amount of milk by combining it with the Zucchini liquid. 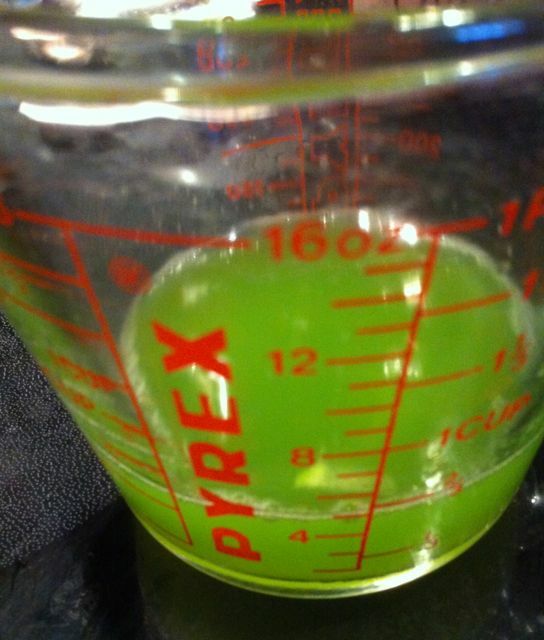 Plus the Zucchini liquid is an awesome bright green color that just makes me happy. Zucchini juice green — why isn’t there a Crayola Crayon in this color? 3. Combine the Apples and Zucchini with the Cinnamon and set aside. 4. 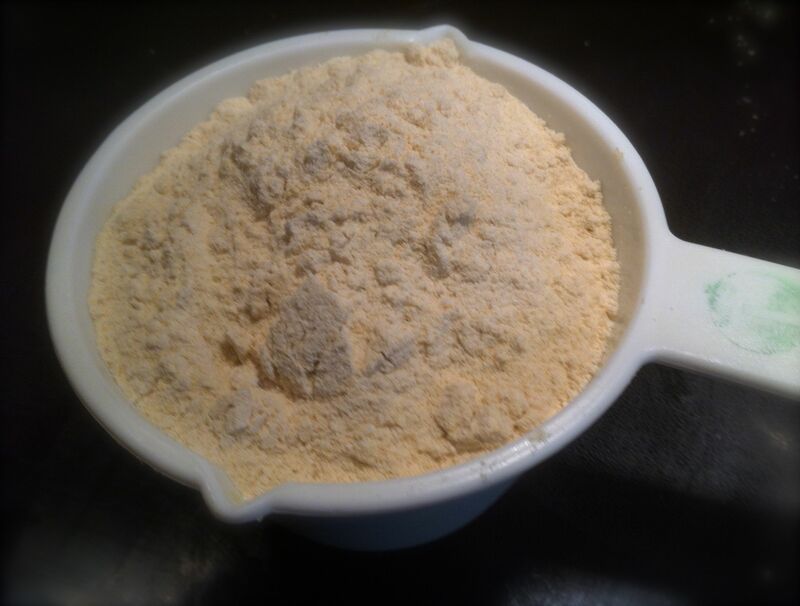 In a medium bowl combine the regular Flour, the Buckwheat Flour, the Baking Powder and the Salt. 5. In a large bowl melt the Butter. 6. Add the Sugar to the Butter and mix. 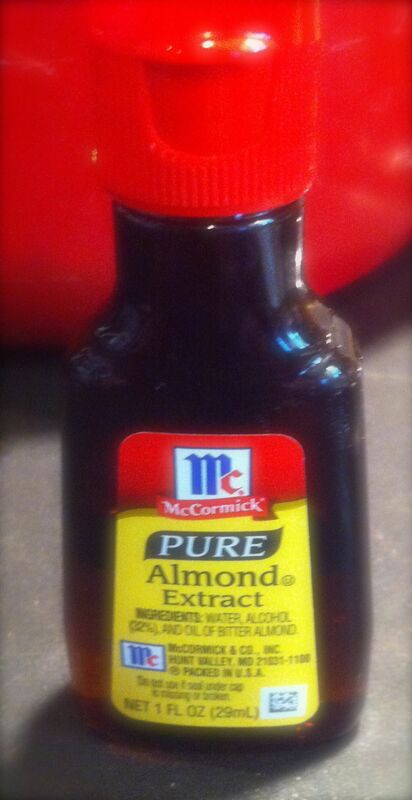 Add the Vanilla and Almond. 7. Add the Eggs one at a time to the Butter/Sugar mix. 8. Add the MIlk/Zucchini to the liquid. 9. Working in thirds combine the wet and dry ingredients. Mix until combined, but don’t over beat. 10. Add the Apples and Zucchini. 11. Divide the batter evenly into 24 muffin cups. 12. Bake for 30 minutes or until the muffins are golden brown and prove done when tested with a toothpick. 13. Remove from oven and let cool for 5 minutes then remove from pan. Enjoy warm or cool. Mom-Mom S. was over for the weekend and she gave these muffins an unqualified stamp of approval. 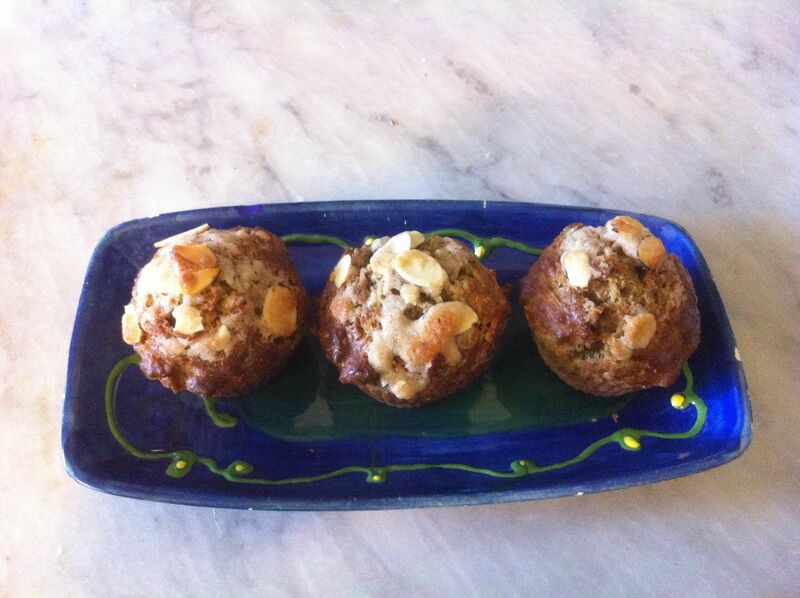 She particularly liked the hint of almond that the extract gave the muffins. I like the little sweet kick you get when you bite into an apple morsel. We had them “right from the oven” with tea and they were delightful. But they are mighty good at room temperature too. The apples were also from the farmer’s market. I picked these up at the Manor Produce stand. The good folks at Manor Produce were able to guide me through the orchard of offerings on the table to the best apples for baking. (And they were right). They also had THE best fresh pressed apple cider. Ahhh Fall. How I love thee. 1. Pre heat the oven to 400 degrees. 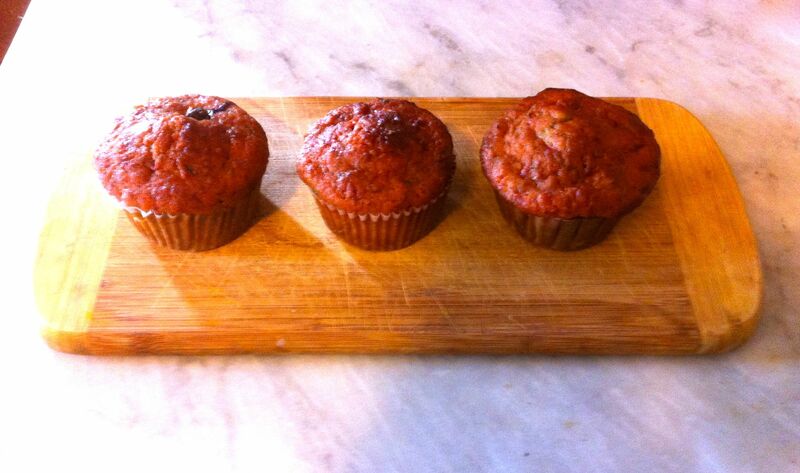 Prepare muffin cups by spraying with cooking spray. Set aside. This recipe made 18 muffins. 2. 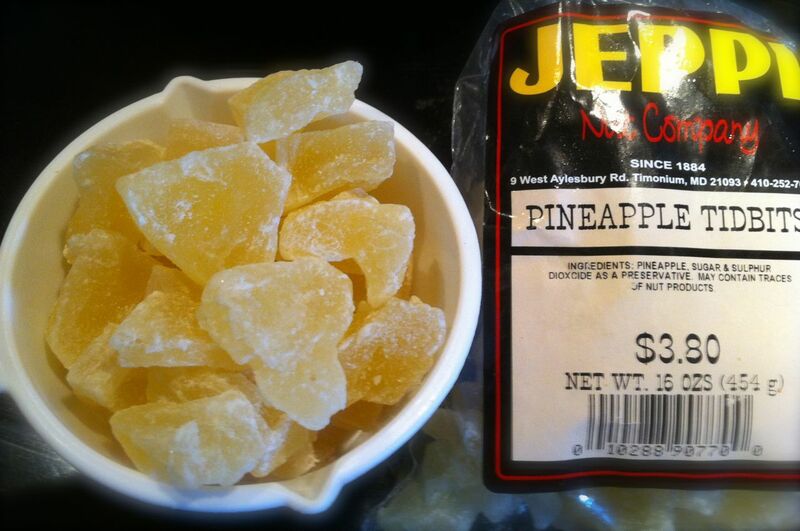 Combine the Pineapple chunks and HOT Water in a small bow and let sit for 5 minutes to soften. Drain. 3. Slice up Strawberries. Put the Strawberries and Pineapple chunks in a bl and puree. 4. 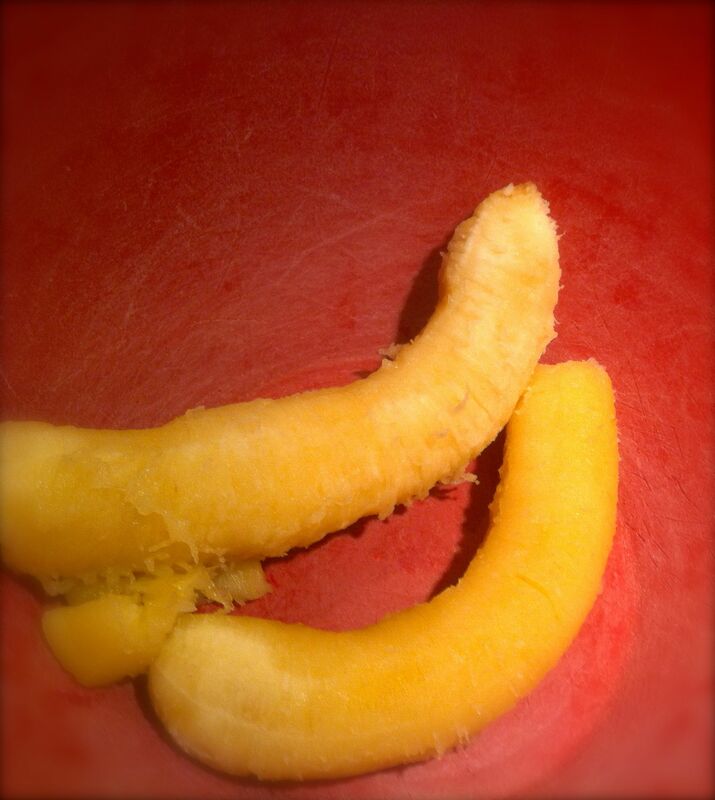 Put the puree in a large bowl . Add the sugar, oil and eggs and mix. 6. 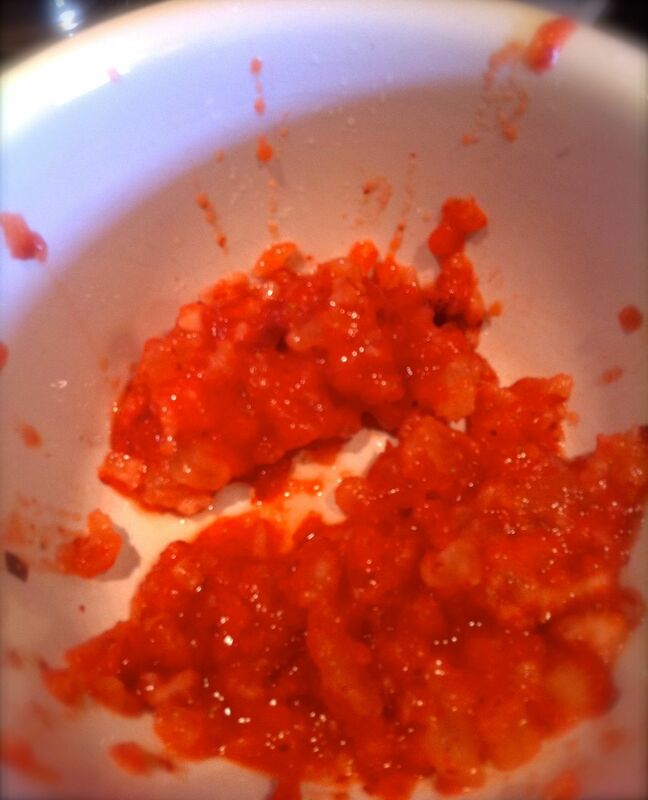 Combine the dry ingredients into the wet ingredients and stir until moistened. 7. Divide into 18 muffin cups. Bake for 15 minutes or until the pass the toothpick test. Remove from oven and cool in pan for 5 minutes. 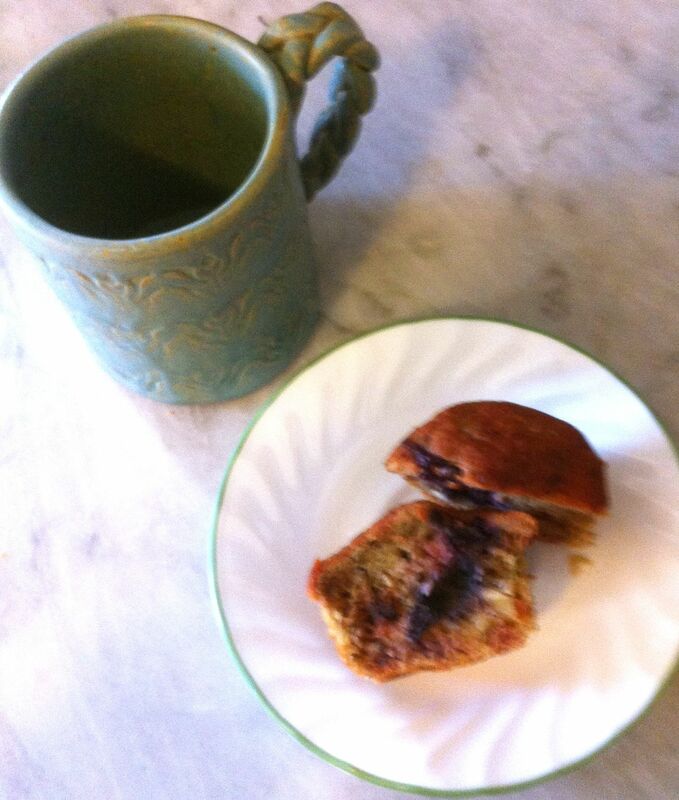 I made these muffins this morning, so all my reviewers are either at work or off to college. Although I suspect Jackie (and perhaps a few of her friends — depending on how generous she feels) might leave a review in a few days, for now you’ll have to take my word for it… These are lovely. 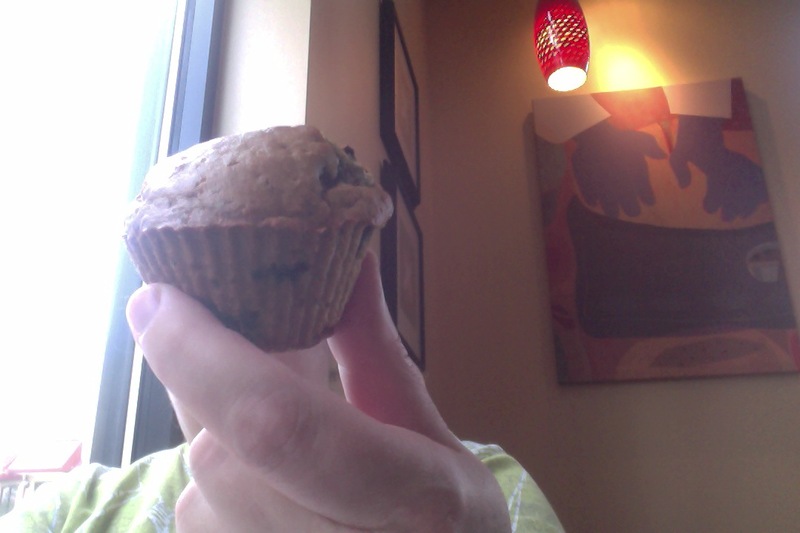 Granted I’ve never met a muffin I didn’t like, so… there’s THAT. But these are sweet and fruity and the tops are crunchy. Light and dry enough not lose their bloom in the box as they make their way from here to a certain big town University to the north via USPS. You know what’s cool? When you really love something — like baking — and you love some people — like nieces — and those two things collide. I’ve known for sometime my niece Annie was a pretty amazing chef, but today I learned that Maggie L.’s creativity and talent extends to the kitchen. 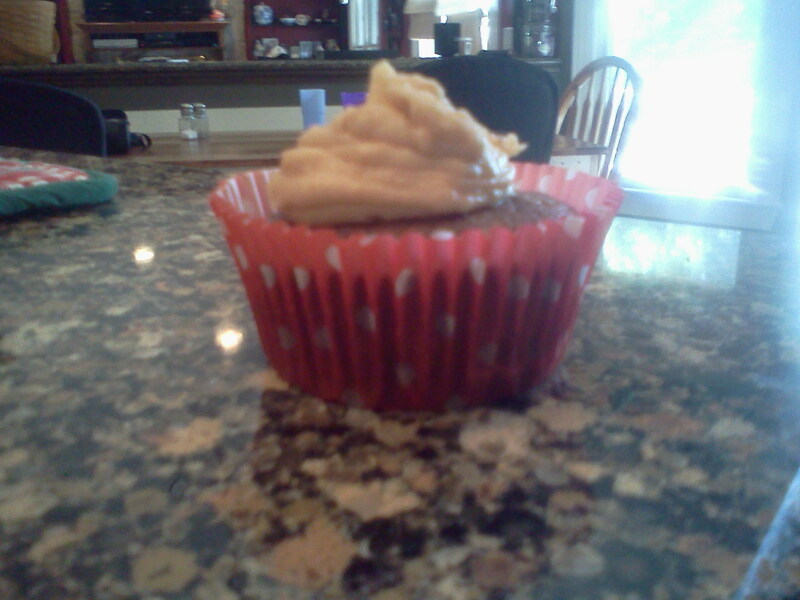 Magz showed me how to make her Peanut Butter Cupcakes today. While not strictly a candidate for MUFFIN Monday… I’m using my Blog-goddess “Do What the Heck I Want For FREE” card and putting this is in. 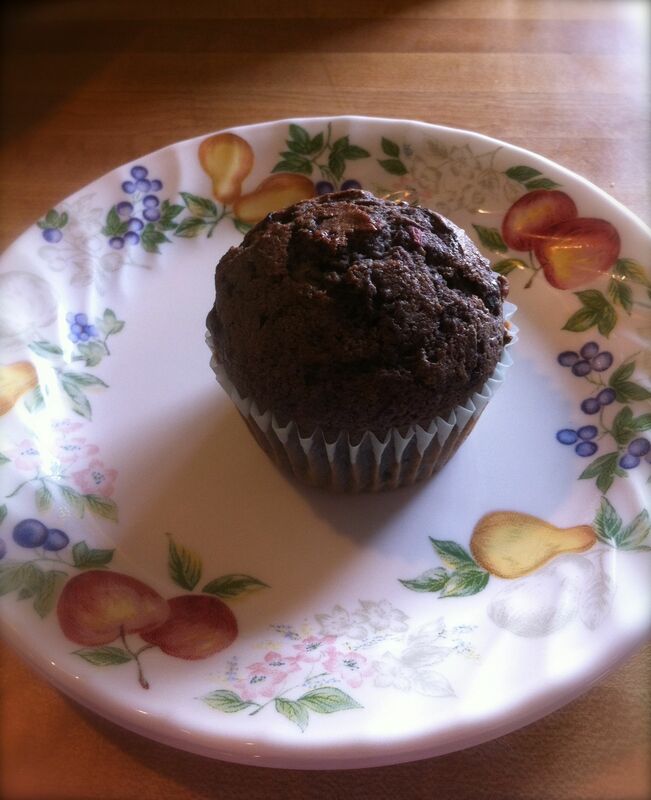 Thanks Maggie for guest blogging with me and sharing your awesome recipe! 1. Pre heat oven for 350 and line muffin tin with muffin pants. 2. Follow the directions on the back of the boxes (but only use a third of the additional required ingredients for each box) (Directions and Additional Ingredients may vary for each type of cake). 3. Swirl the chocolate and vanilla batters to marble. 4. 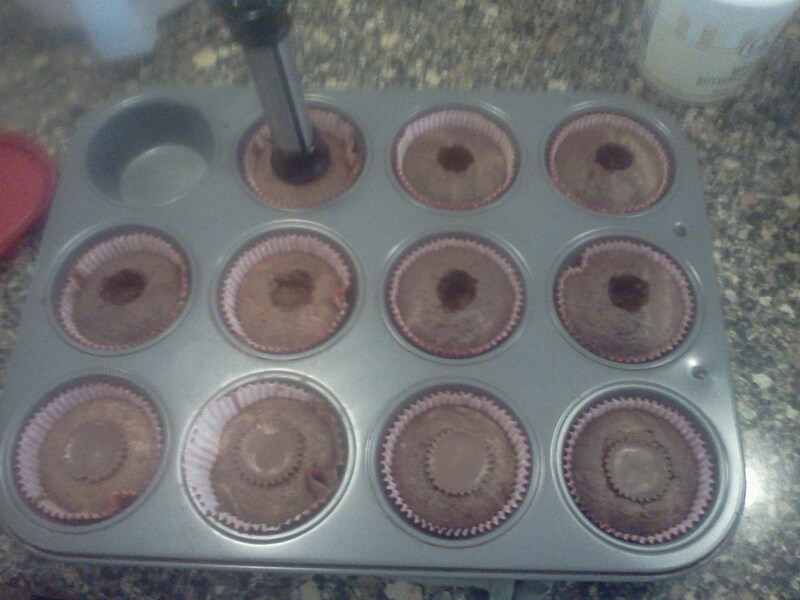 Divide the batter into 22 to 24 cupcake cups. 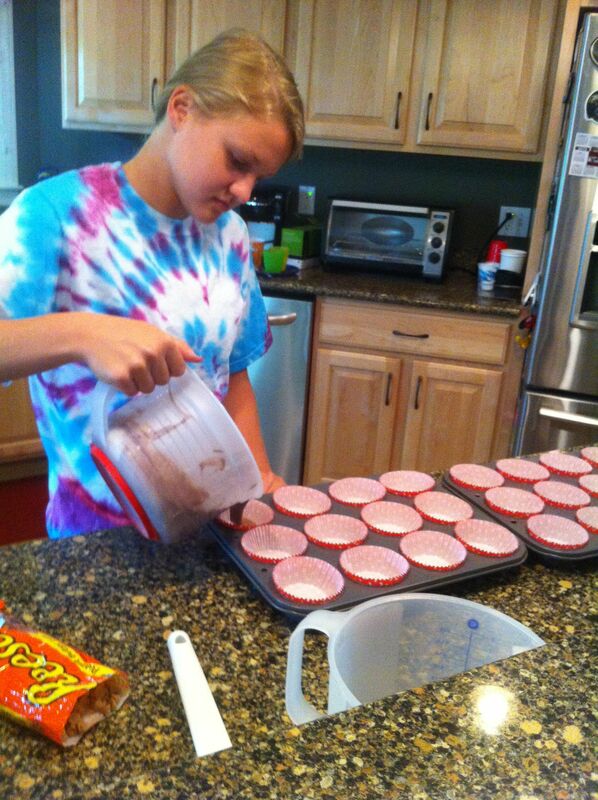 (Maggie’s made 23 cupcakes). 5. Bake for 17 minutes until tops of the cupcakes are golden brown, and the cupcakes pass the toothpick test. Remove from oven and let cool in the pan for 2 minutes. 6. 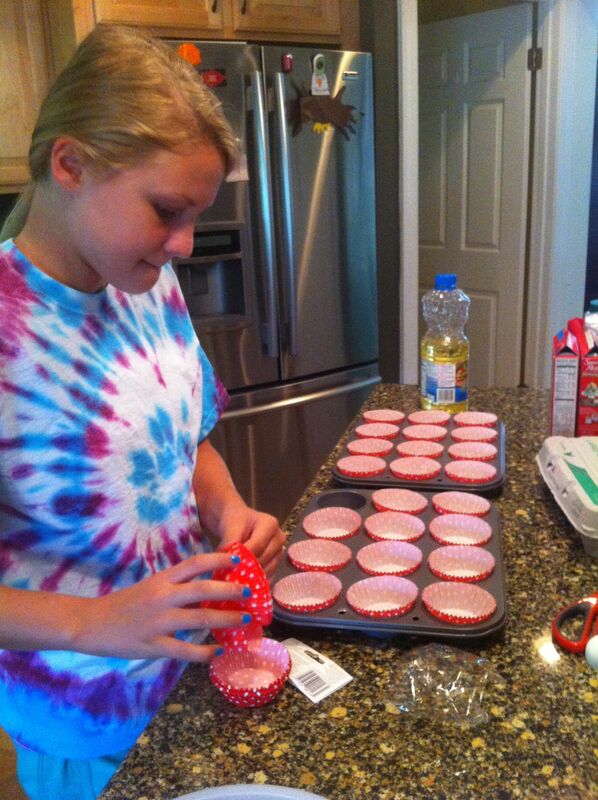 Using an APPLE CORER punch a hole about 1/2″ deep in the middle of each cupcake. Drop a mini Reese’s Peanut Butter Cup into the hole. The Chocolate of the Reese’s will melt into the cupcake. 7. Let the cupcakes cool completely as you make the frosting. 1. 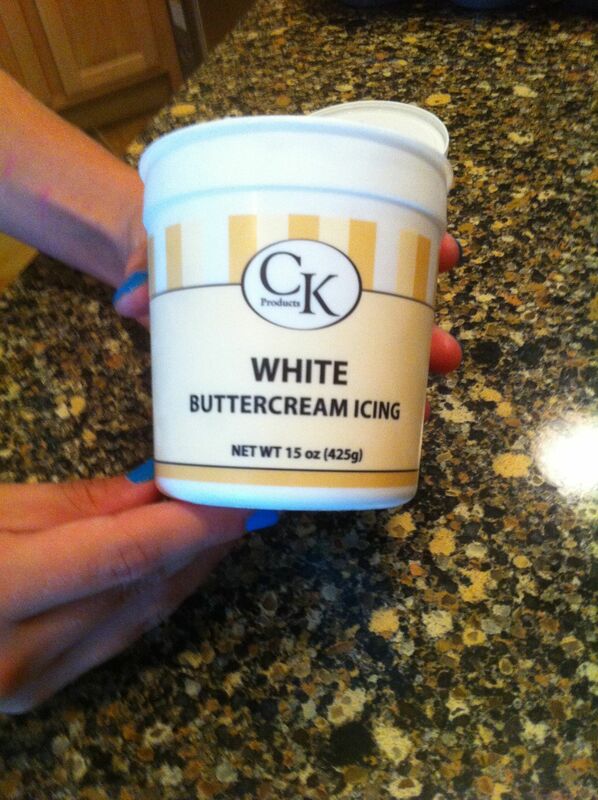 In a medium bowl cream the softened Butter Cream Icing. 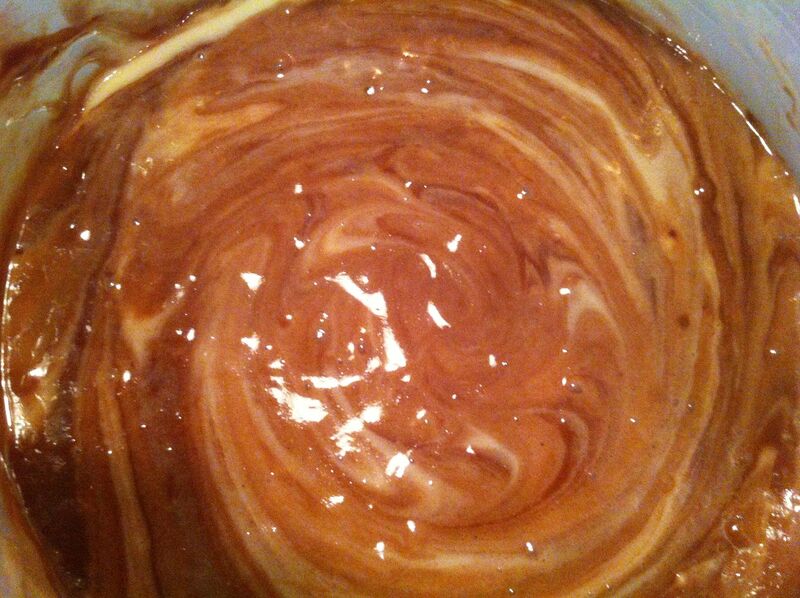 Slowly add the Melted Peanut Butter Chips. 2. Add the Milk one dash at a time until Frosting is smooth and easy to work with. 3. Add remaining frosting ingredients and mix completely. Frosting should be smooth. 4. 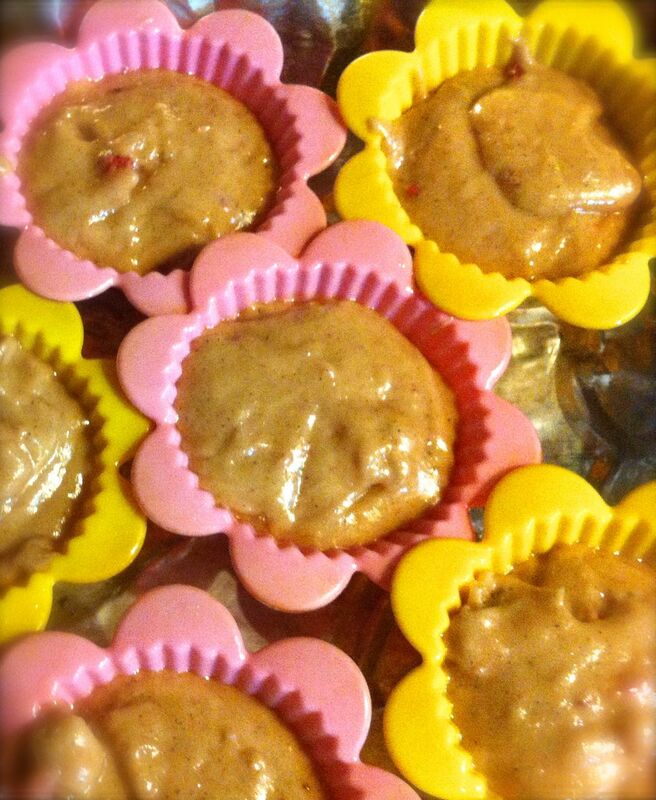 Using a spatula or pastry bag top the cooled cupcake with frosting and enjoy! 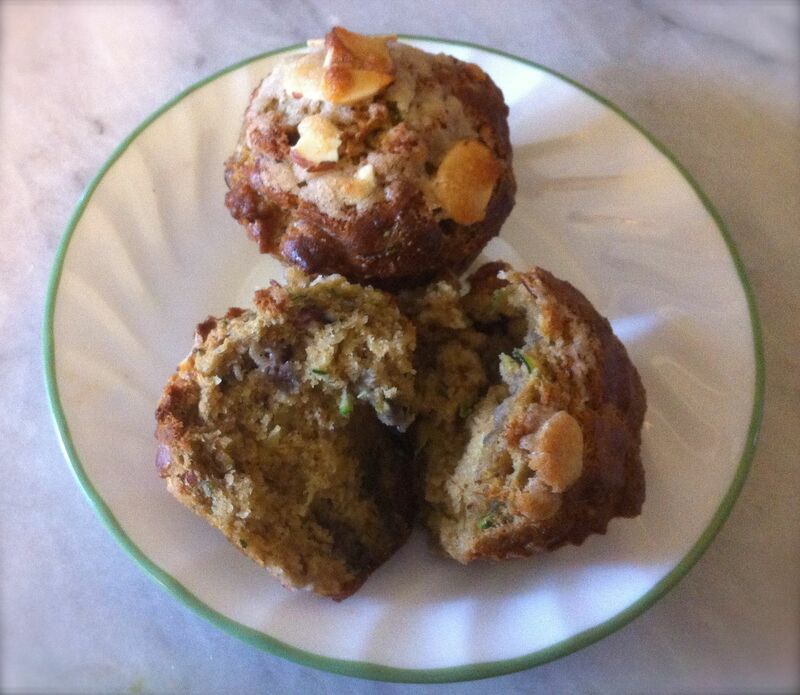 I know, I know… it sounds like I should be making soup, not muffins, but this combination of special ingredients when paired with our old friends Zucchini, Almond and Blueberry made for a nice flavor profile in this week’s Muffin Monday selection. 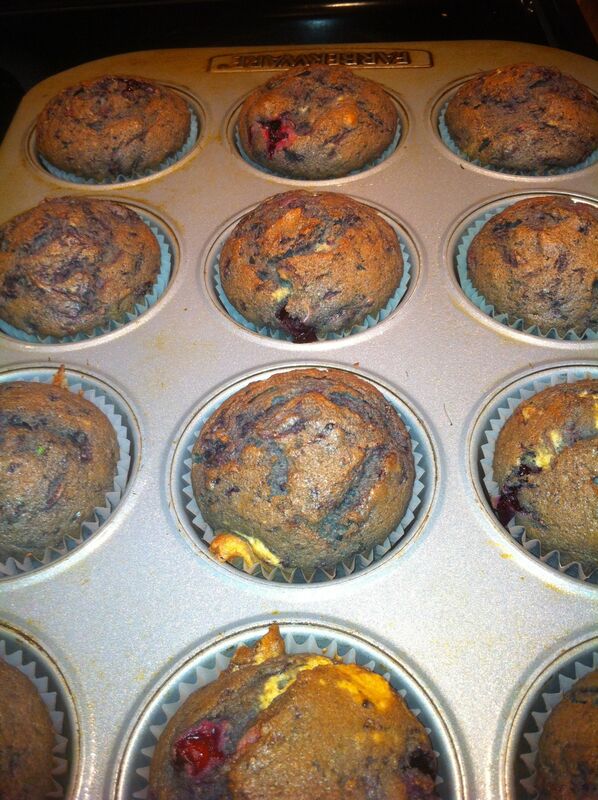 2/3 cup slightly mashed Blueberries. 1. Preheat the oven to 400 degrees. 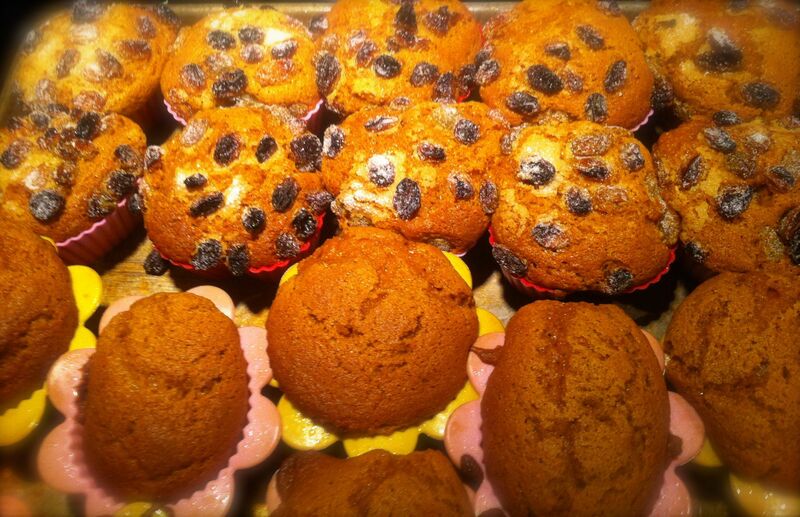 Prepare the muffin cups by spraying with cooking spray. 2. Grate the Beets and Zucchini. Finely chop the Fennel Fronds. Gently mash the Blueberries with a fork. Set aside. 3. In a blender process the Almonds until they are finely ground..
4. In a large bowl combine the Flour, ground Almonds and Baking Powder. 5. In the blender (because why dirty another bowl when you’re gonna have to clean that blender anyway) pour the Milk, Vanilla, Eggs, melted Butter and Sugar. Blend until smooth. 6. Add the liquid to the dry and mix well. 7. Gently fold the chopped/grated vegetables and the mashed Blueberries into the batter. 8. Divide the batter evenly between the muffin cups (this recipe made enough batter to generously fill the standard 12 muffin tin plus two extra muffin cups). 9. Bake for 35 minutes until the tops are brown and the muffins pass the toothpick test. Remove from oven and let cool in pan for 5 to 10 minutes. 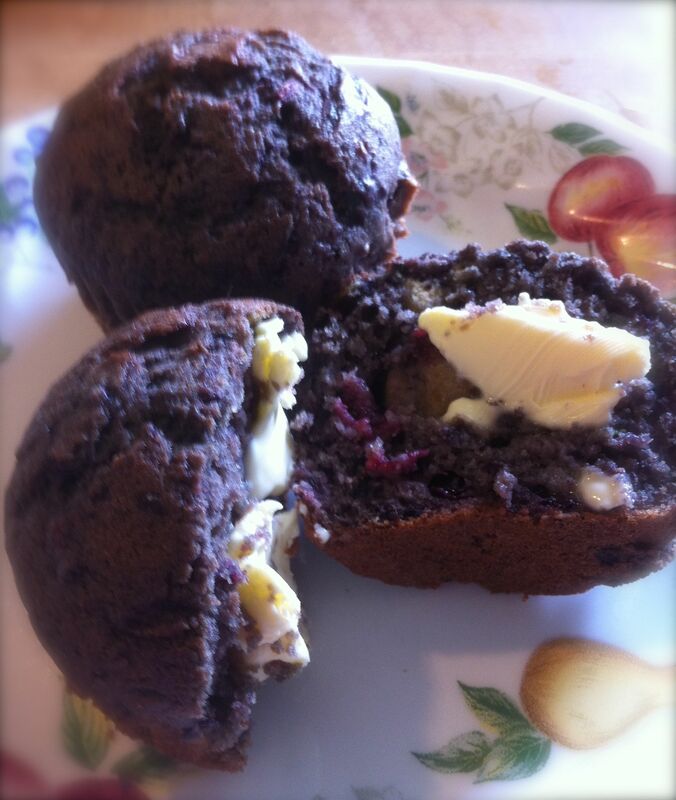 Beets, like zucchini, seem to lose themselves in the delightfulness of muffindom. None of us could really point to the muffins and say “Hey, you put beets in there, didn’t you?” The muffins just taste yummy. 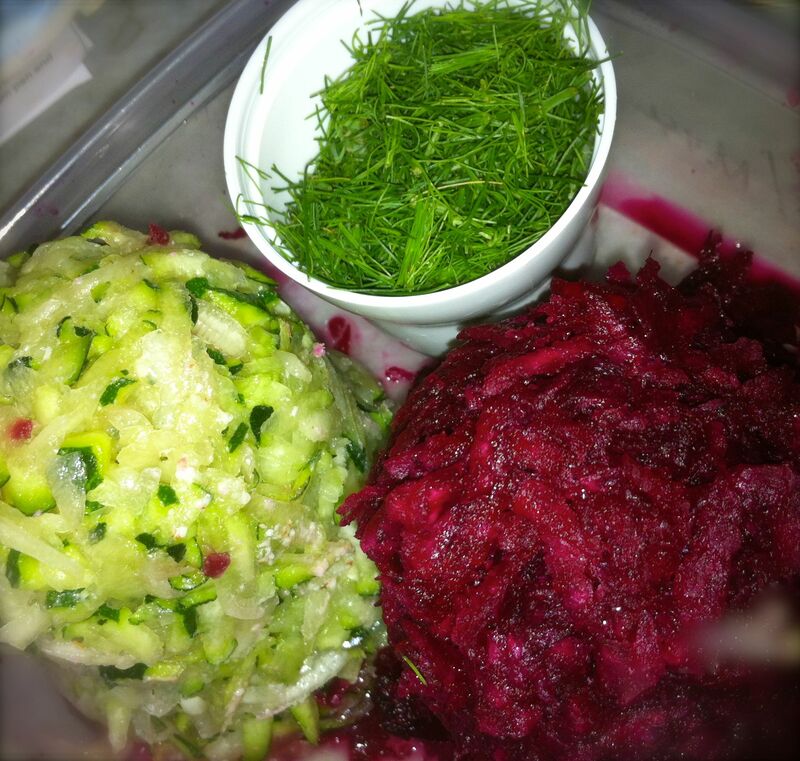 As for the fennel there is a hint of fennel’s licorice flavor, but it is far from overwhelming. Ohhh, I know I shouldn’t have favorites, but I DO love Muffin Mondays. We’re lucky enough to have a couple of mature blackberry bushes and a newbie blueberry bush in the yard. The berry yield for this pretties came from those obliging bushes. I only had one stalk of rhubarb left from the other day’s recipe. That came out to about a quarter cup when grated. 1. Preheat oven to 400 degrees. 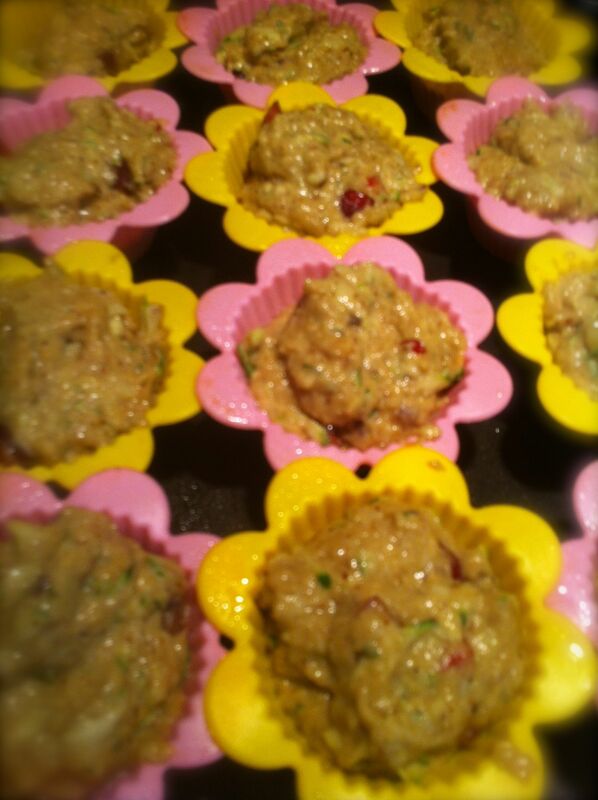 Prepare 18 muffin cups with liners and cooking spray. 2 .In a large bowl gently mash the berries with a spoon. 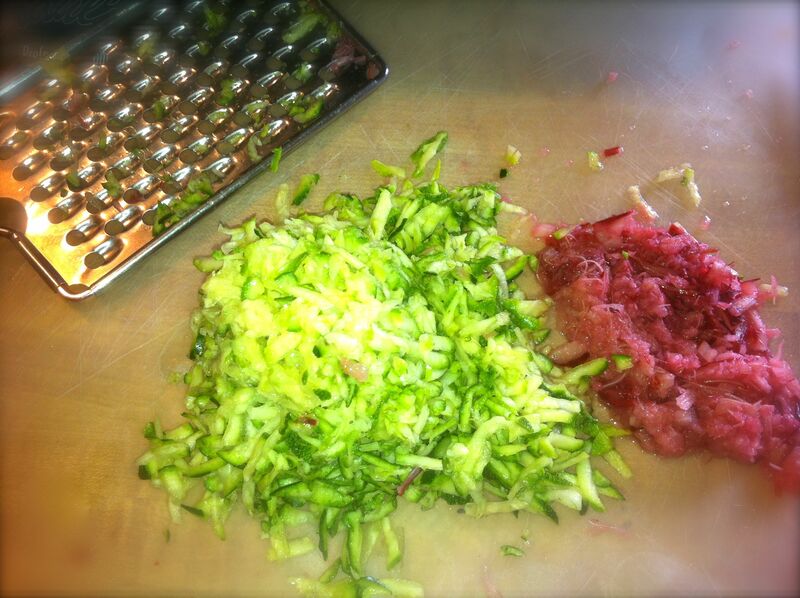 Add grated Zucchini, Rhubarb and 1/3 Sugar. Mix. 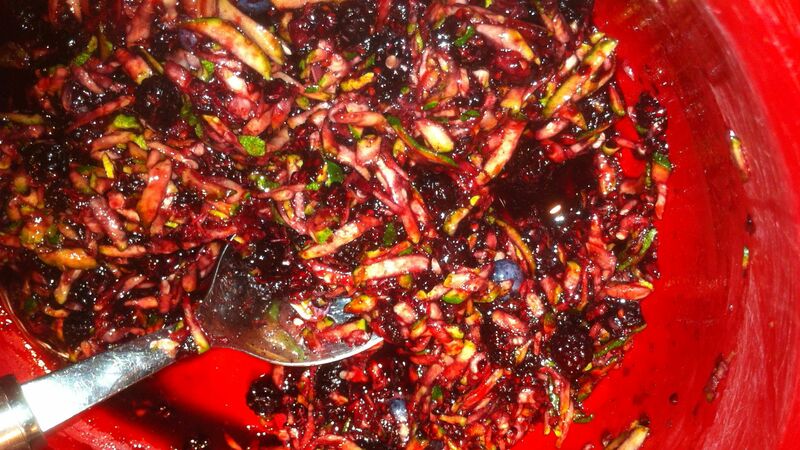 Mashed berries, Zucchini and rhubarb. 3. 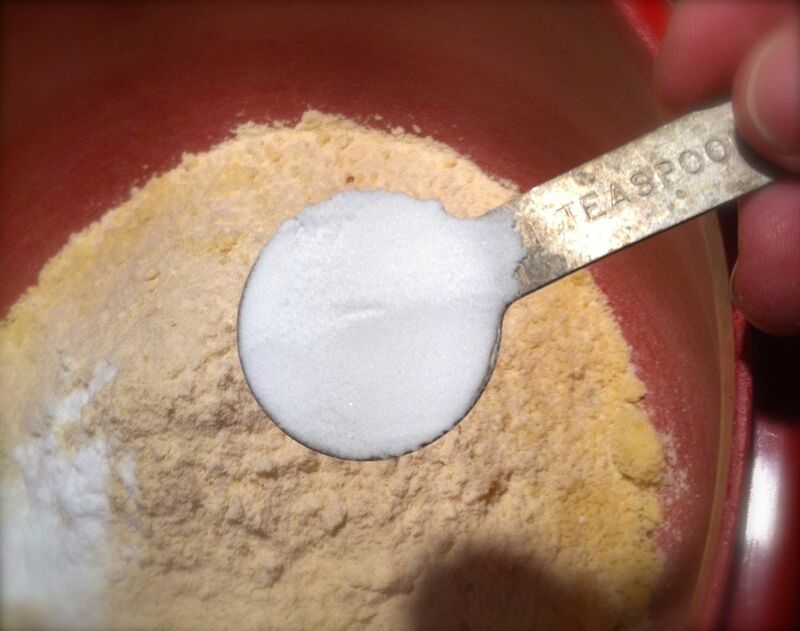 In a second bowl combine the Flour, Baking Powder, Baking Soda and Salt. 4. In a third bowl (do you see a pattern here?) combine the Eggs, Milk, 1 cup of Sugar, Vanilla and Butter. 5. 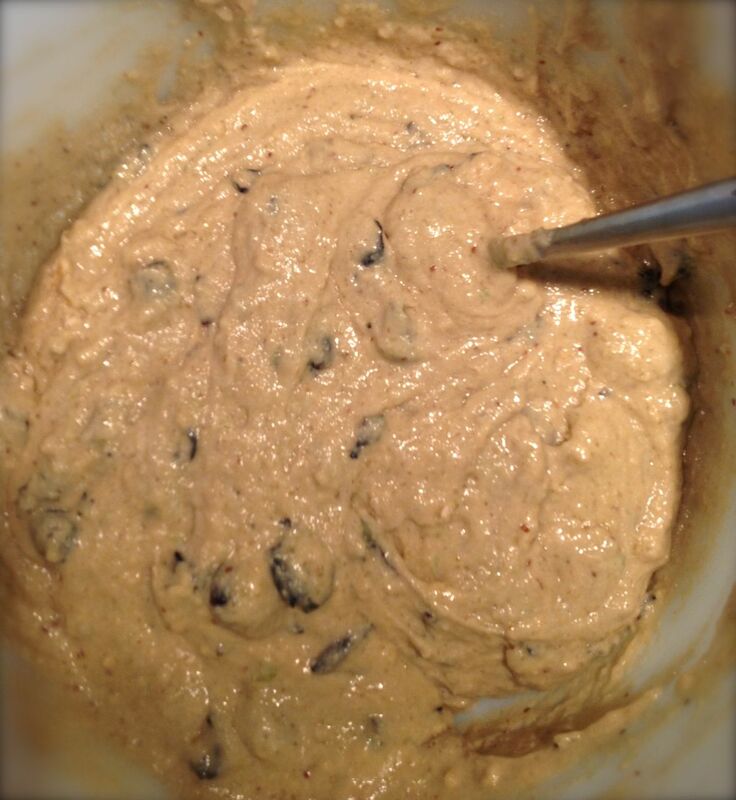 Add the Egg/Milk mixture to the Flour and stir until combined to form the batter. 6. 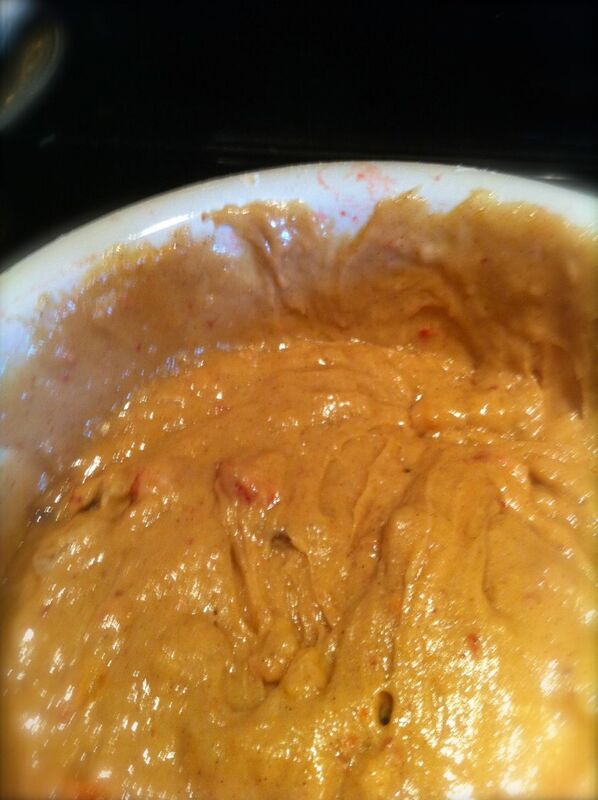 Fold the Berries into the batter. 7. Divide evenly into muffin cups. BAKE for 20 minutes. 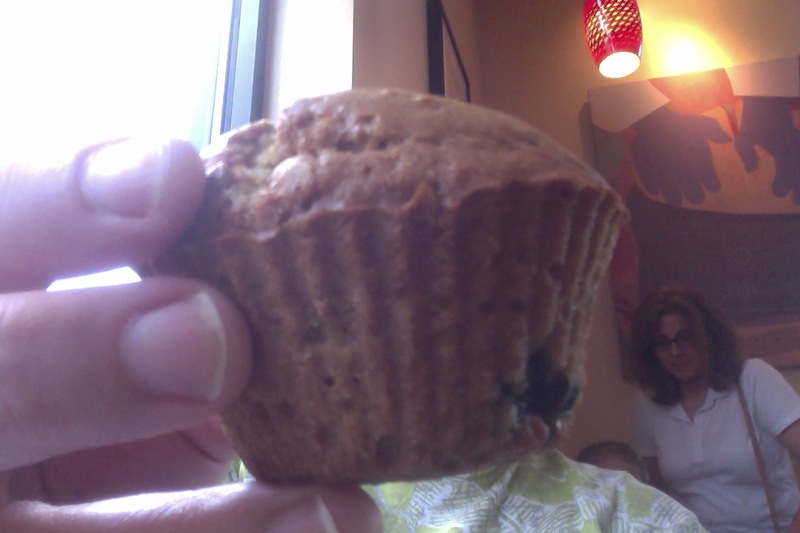 A toothpick inserted into the center of a muffin should come out clean. Fresh from the oven muffin-y goodness. 8. Let cool 5 minutes and remove from muffin cups. Enjoy with some butter. 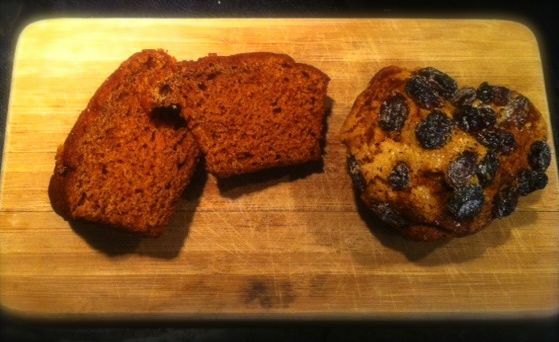 No taster quotes today as Maggie is at work… so you’ll have to take my word for it… these muffins are yummy, light and the perfect moisture level. My only complaint would be the number of bowls I had to employ to make them. Preheat oven to 400F. Prep 12 muffin cups by spraying with baking spray. In a large bowl combine the whole wheat flour, the cornmeal, salt, baking powder and stir. 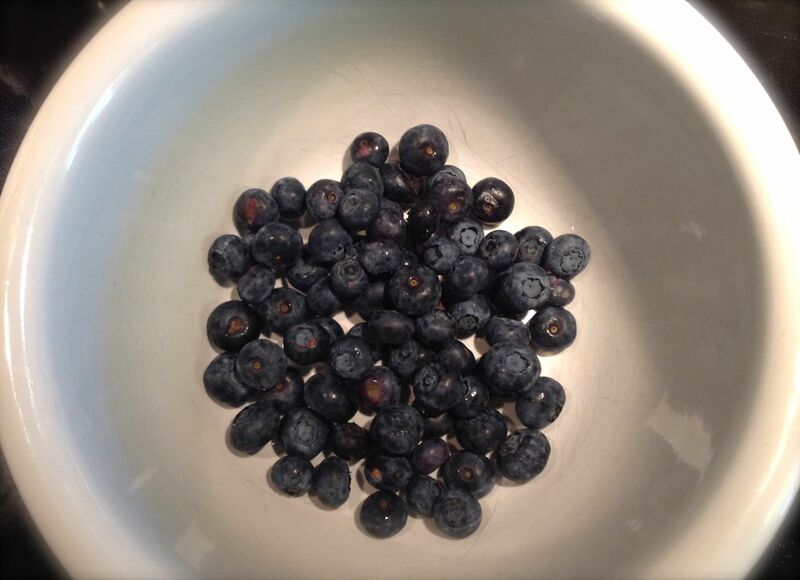 Into another bowl gently mash the blue berries add the oil, almond milk and honey. 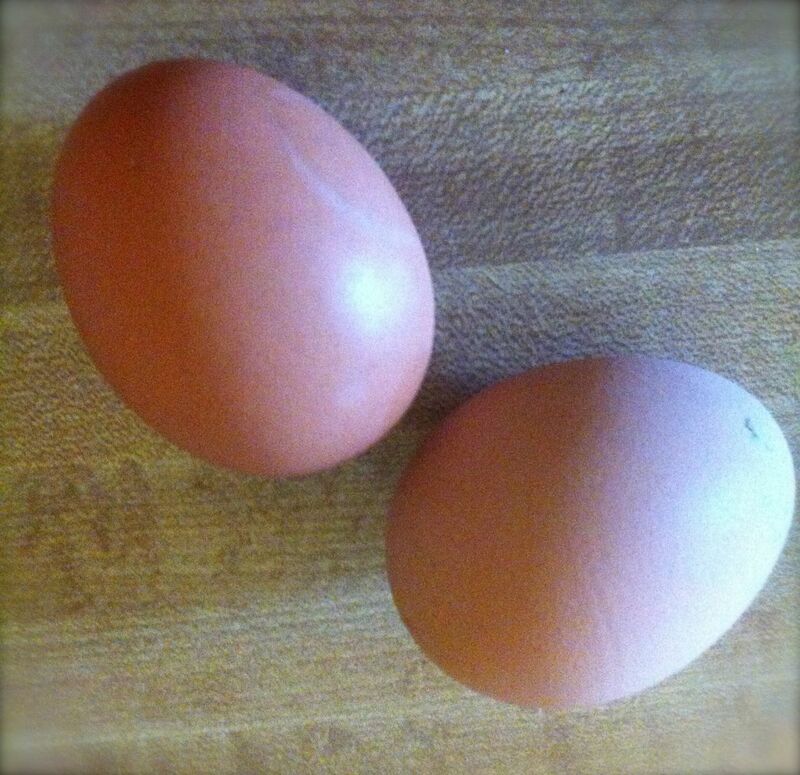 add the eggs one at a time. Stir with a fork until smooth. Pour the liquid ingredients over the dry ingredients and stir gently until all is wet. Divide the batter evenly into the muffin cups and bake for about 15 minutes, or until one tests done with a toothpick. 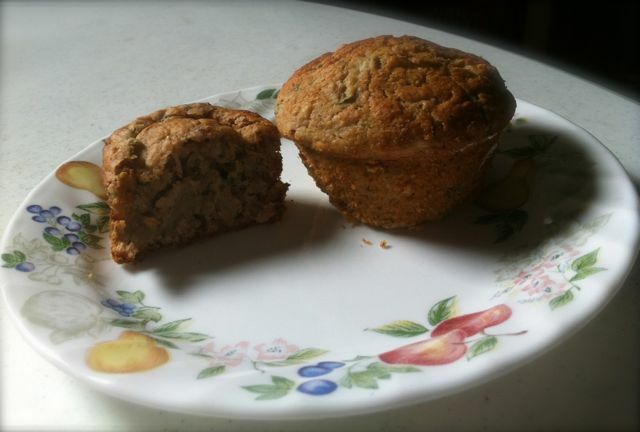 The cornmeal gave these muffins a denser, hardier vibe. The blueberry and sugar made them just sweet enough. Happy Muffin Monday everyone! 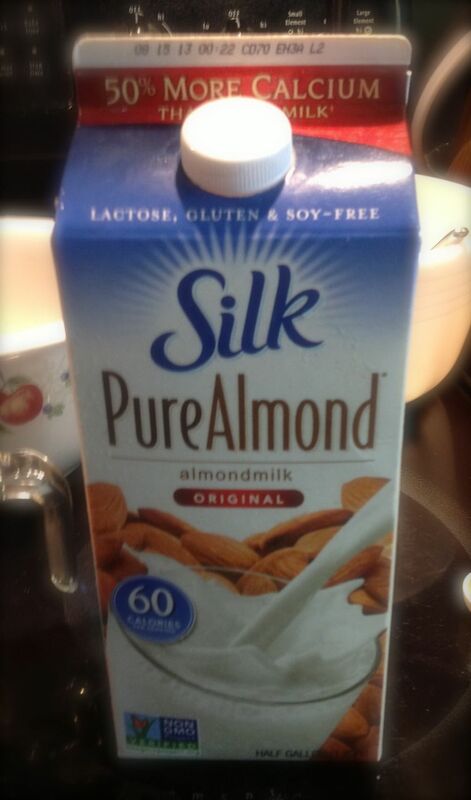 Here’s a recipe for all you Dairy Free folks out there. Hope you like it! 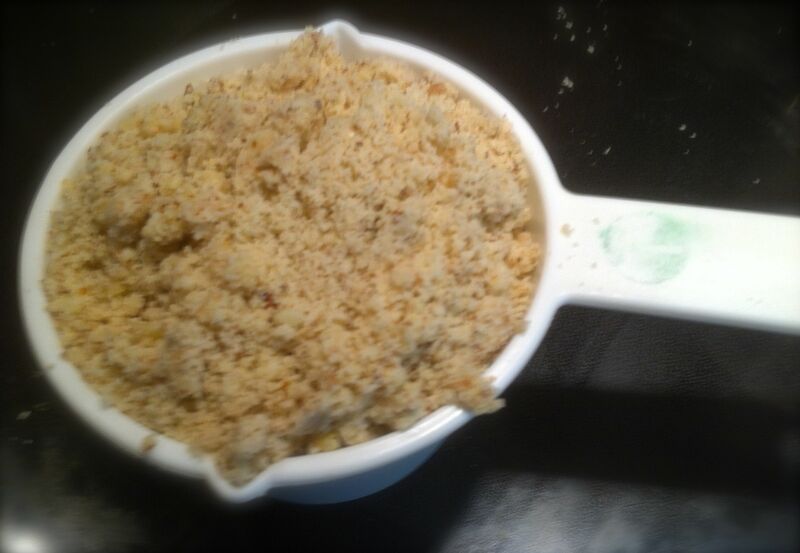 1 Zucchini (grated) Topping: 2 tablespoons Almonds (silvered) 2 tablespoons Whole Wheat Flour 2 tablespoons White Sugar 2 tablespoons melted Butter DIRECTIONS: 1. Preheat the oven to 350 degrees. Prepare muffin cups. 2. In a large bowl place Flour, Almond Meal, Salt and Baking Soda. Mix. 3. In a medium bowl, mash the Bananas add Eggs one at a time, mixing well with each addition. 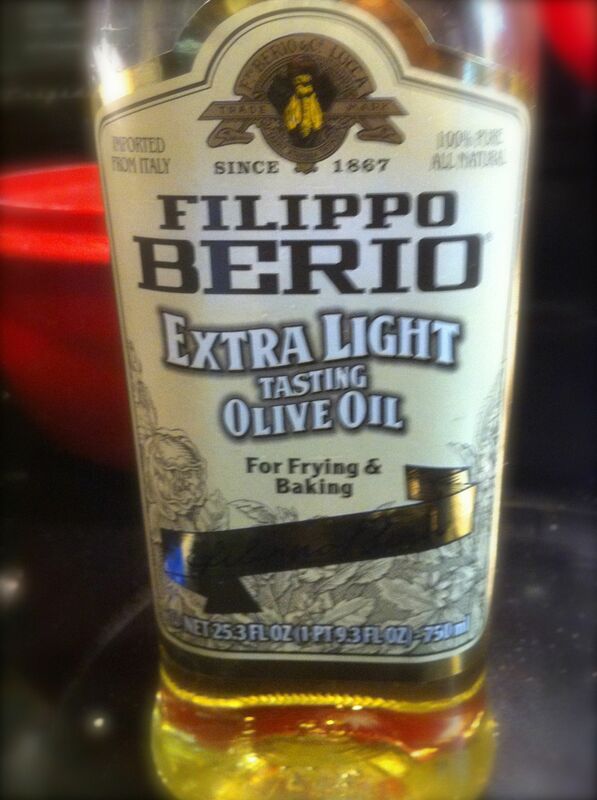 Add Olive Oil, Demerara Sugar and Almond Extract. 4. 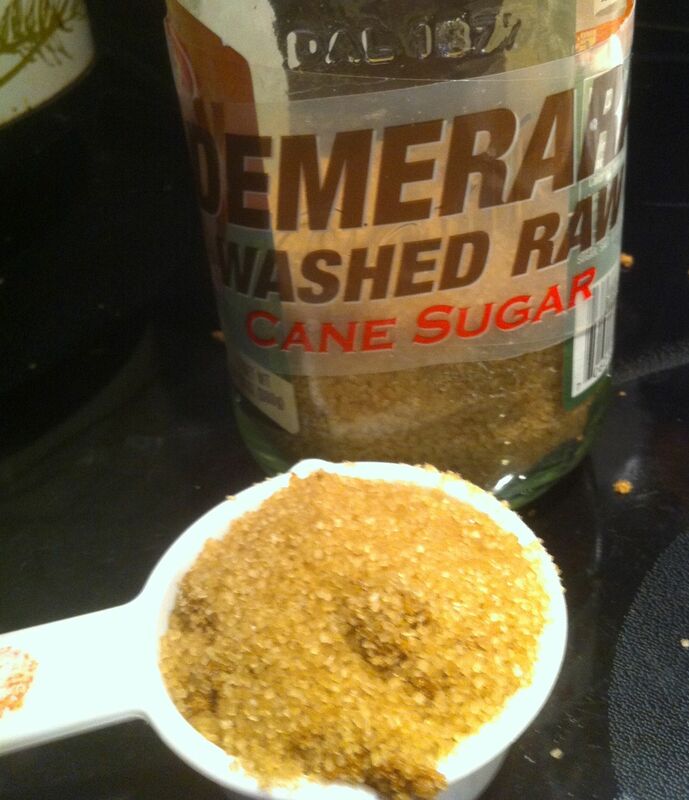 Mix the dry and wet ingredients together. 5. 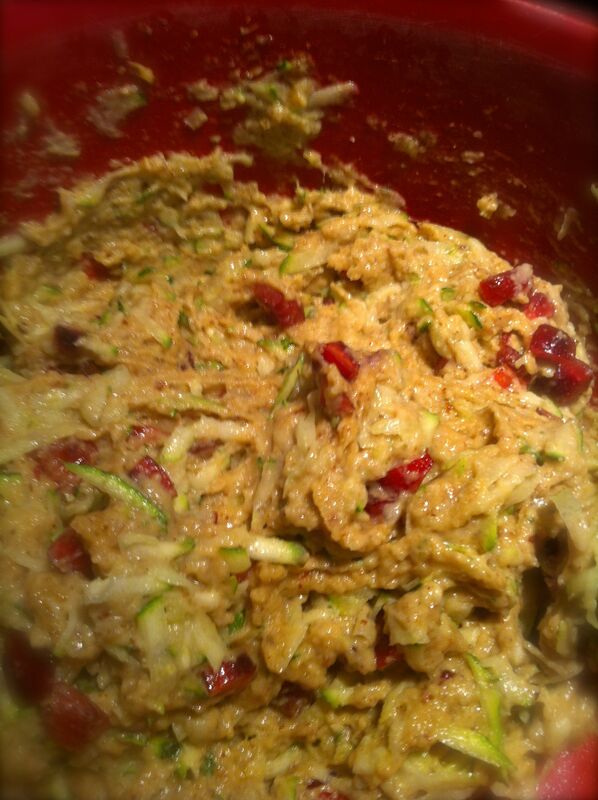 Add the Cherries and Zucchini and mix gently. 6. 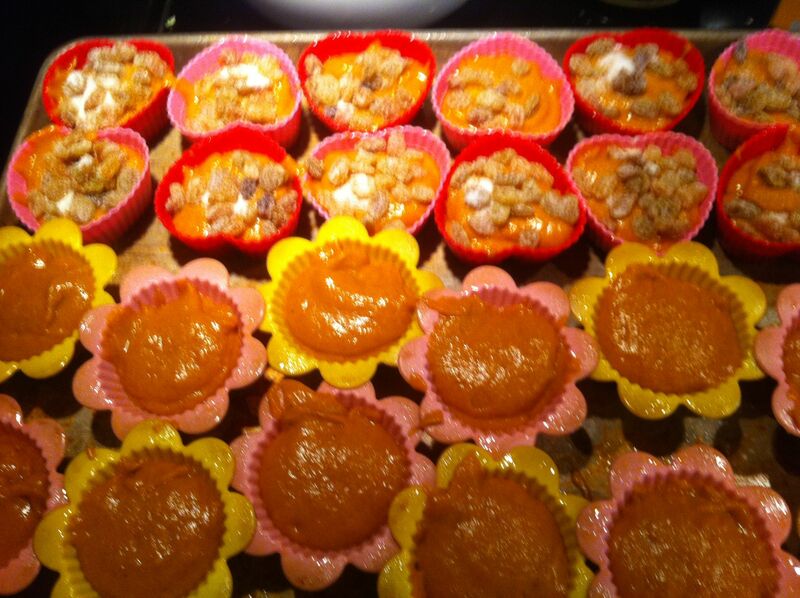 Divide the batter evenly into 12 muffin cups. 7. In a small bowl combine all the topping ingredient. Divide evenly onto the muffins. 8. 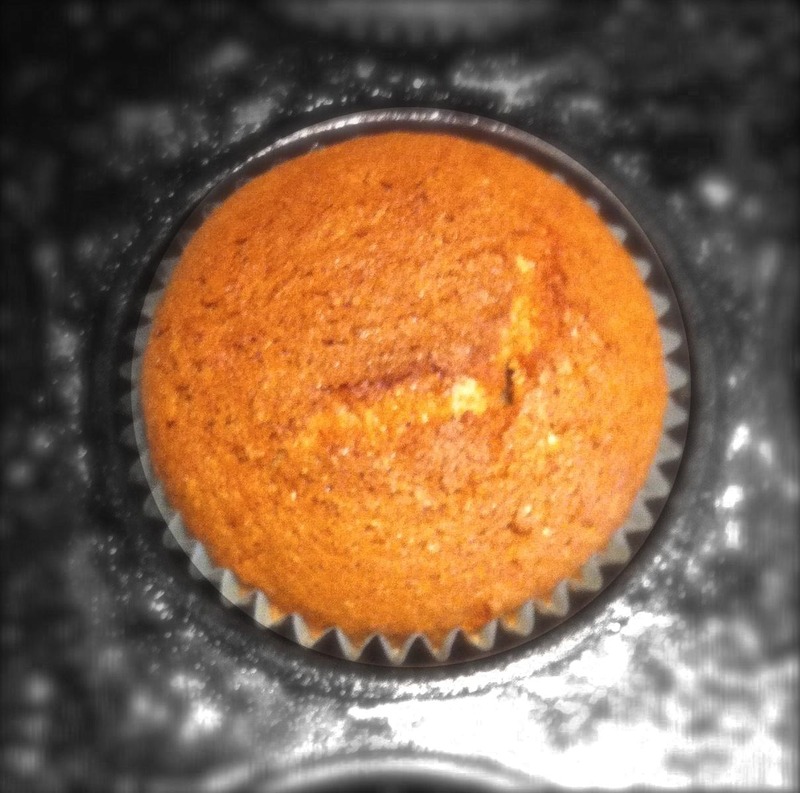 Bake for 20 minutes, or until a toothpick inserted into the center of one of the muffins comes out clean. Both Maggie and I thought these muffins could have used a little more sugar… so you might want to add a bit more, or serve with marmalade. They are moist — especially considering there’s no milk or butter in the recipe — and moderately fluffy. 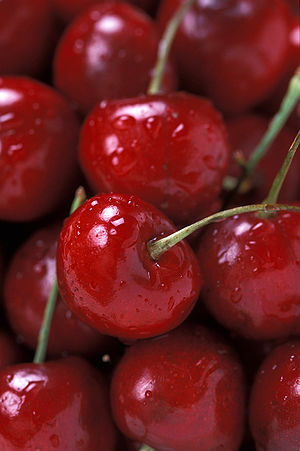 You can really taste the Banana, not so much the Cherry. Give ’em a try and let me know what you think.